What was Pico Della Mirandola known for? 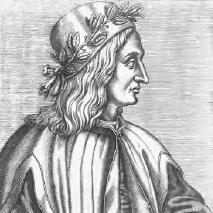 Giovanni Pico Della Mirandola (1463–1494) is most famous for his “Oration on the Dignity of Man,” which was the introduction to his 900 Theses, which he wrote in order to debate publicly in Rome. A papal commission censored 13 of the theses, but after Pico attempted to justify them with his Apology, they were all condemned by Pope Innocent VIII (1432–1492). Pico sought refuge in France, and after he was imprisoned there he went back home to Florence, where he continued his writing. He had a strong interest in the same hermetic tradition introduced by Ficino, although he argued against part of it in his Disputations against Astrology. While Pico’s “Oration on the Dignity of Man” has been heralded as a classic example of Renaissance humanism, Pico believed that the dignity of man was located in his proper place in the cosmos. The freedom of man, which Pico is so famous for proclaiming, is thus not the freedom for human beings to create themselves or chart their own destinies, but rather the traditional Christian freedom of being able to choose between good and evil as defined by Christianity. Giovanni Pico Della Mirandola was persecuted by the Church for his “Oration on the Dignity of Man” (iStock).